The Tourism board of Kaiserwinkl invites Austrian journalists to their region and between them I am chosen with my colleague Elena Paschinger www.creativelena.com. The route to Kufstain from Vienna takes less than 4 hours using the high speed train ÖBB. During the trip we meet the other journalists and one of the organizers from Kaiserwinkl, managing director Thomas Schönwälder. 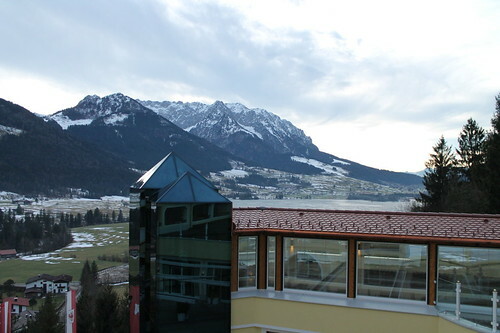 A bus takes us to Hotel Panorama, our deluxe accommodation in the village of Walchsee. There we spend all afternoon enjoying their facilities: Jacuzzi, warm swimming pools, saunas, steam rooms, and areas to relax. For dinner we are served a sybarite menu while Thomas talks about the activities of the programme that await us. Almost all of them are about winter sports in the snow, so as an Andalusian that sounds very interesting to me. After a nutritious breakfast the following day, we go to the cross country skiing school of Franz Schuler. The place offers a track of about five kilometres to learn this discipline. I try cross country skiing with sticks for first time in my life! Going up the slope is not difficult; the trouble is when you go down avoiding falling. I have fallen down three times but the experience is positive for a beginner like me. In the afternoon we visit the family cheese factory Plangger, which produces organic cheese. Their cows only eat herbs from the mountains. After trying a variety of yummy cheeses we return to the hotel in the sauna and swimming pools before dinner. The day after, it is the last day of the programme and I am very excited because I am going to receive my first skiing lessons in the resort of Kössen. My colleagues go up the mountain slopes because most Austrians learn to ski right after walking when they are children. I find myself in a small slope with children and my instructor. After learning basic movements and keeping the balance I use the magic carpet (a small lift) to get to the top of the slope. Going down the slope is very funny but the problems are breaking and keeping the skis in the correct position. Near my learning area there is an esplanade where the people who try paragliding and hang gliding are landing. Some of my colleagues are doing paragliding in tandem. I have the choice to try it too, but I rather keep training the turns with my instructor. I love skiing and I think this sport is addictive because you always want more when you are learning. In the afternoon we go to try snow tubing, one of the fastest winter sports. Snow tubing is great because you do not need lessons; you just pick a large “tubing” and ride the chairlift to the top of the ski slope. Then you ride down about 100 meters until your tubing stops. Snow tubing guarantees you adrenaline and a lot of fun. Our experience finishes with a ride in a horse-drawn carriage that takes us to a typical Tyrolean restaurant. There we try Austrian dishes like Kasspatzle, a kind of pasta with a lot of cheese. It is delicious. Here there is my video with the highlights of Kaiserwinkl. This entry was posted in Travel Posts and tagged Austria, Kaiserwinkl, Travel Blog, Winter Sports by Maximo Perez. Bookmark the permalink.